As we charge into 2014, pay-TV operators aren't just toying with the idea of granting consumers access to content from a variety of connected devices; it is now the standard. This shift in viewing consumption has driven operators and technology partners to 'look under the hood' of their platforms and re-assess content delivery and management schemes. For premium content providers with a paywall approach, digital piracy is one of the most pressing issues. But there is no such thing as a "one-size-fits-all" content security approach because there are huge differences between the types of people who pirate content - from those who aim to sell and profit from it to those who are willing to pay, but aren't able to find legitimate outlets. Continuing the year-end series of industry executives sharing their top 3 video predictions for 2012, today's entry is from Jan Steenkamp, VP, Business Development for Irdeto, a leading software security and media technology company. Software security provider Irdeto is acquiring media anti-piracy firm BayTSP, the companies are announcing this morning. BayTSP's monitoring and business intelligence technology will broaden Irdeto's range of security solutions for studios, pay-TV providers and media companies, including its ActiveCloak renewal security system. BayTSP counts Comcast, Sony and Toshiba among its clients. Martin Sendyk, Irdeto's SVP, Product and Stuart Rosove, BayTSP's CEO briefed me on the details late last week. Software security firm Irdeto is launching Active Cloak for Media this morning, a dynamic security service intended to protect premium content across the ever-growing universe of connected devices. I had breakfast with Daniel Thunberg, Irdeto's VP of Marketing, who was in from Beijing last week, to learn more. Irdeto has had a strong position in DRM with its core Cloakware DRM technology embedded in online video services and devices from Comcast, Netflix, Adobe, Sony, and Logitech among others. But Irdeto has recognized that DRM itself is often the subject of hackers' attacks and when they succeed piracy runs rampant. Worse, it's often not apparent to the content owner or distributor where the breach is. The result is a world where content owners often have little idea where their most valuable assets are being viewed. With that problem in mind, Daniel explained that Active Cloak for Media takes a services-oriented approach, deploying a set of server modules and media agents on connected devices which constantly communicate with each other to watch for illicit activity. When detected, the agents renew their security credentials to keep content safe. 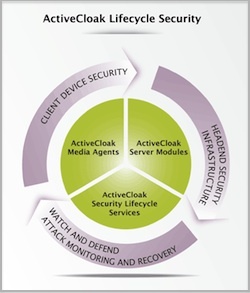 Active Cloak for Media's "lifecycle" security model means that once content is digitally distributed, content owners and/or distributors have a far better view of where security issues exist and what proactive measures should be taken. Logitech has chosen Irdeto's Cloakware to help secure premium content on its new Google TV-powered Revue device. The Revue offers access to subscription services like Netflix, and also open Internet access to other download-to-own and rental models. Irdeto has had a relationship with Netflix, which Irdeto's David Vogel told me yesterday helped the company understand the key security issues and speed integration. Cloakware helps secure the user authentication process and other digital assets. Google TV is still a very new product, but it has already run into hiccups gaining access to free content, with most major broadcast TV networks and Hulu blocking their programs. The premise of being able to access paid and free, premium and independent video, all through one box, still remains an exciting prospect however. Irdeto, the digital media security provider, is announcing this morning that Netflix has licensed the company's Cloakware Embedded Security software as part of its solution to secure content streamed to multiple consumer devices. Cloakware is a set of tools to defend against unauthorized tampering and attacks. Irdeto has a broad customer base internationally and has lately been raising its profile in the U.S.
For Netflix, the push for enhanced security comes as the company begins expanding to additional CE devices beyond the desktop for its hugely popular Watch Instantly streaming feature. The iPad is the first new device Netflix has targeted, and its app is considered one of the most widely downloaded in the iPad's first weeks on the market. No doubt this success will spawn further Netflix Watch Instantly implementations, particularly as competing tablets come on the market in 2010 and smartphones proliferate, especially those powered by Android. As Episodic Launches, How to Make Sense of the Crowded Video Platform Space? Surely one of the most enduring questions I and others who watch the online video industry are asked (and in fact often ask ourselves) is: How can video management and publishing platform companies continue to launch, even as the space already seems so crowded? Personally I've been hearing this question for at least 6 years, going back to when I consulted with Maven Networks, whose acquisition by Yahoo was one of the few industry exits (and likely the best from an investor ROI perspective, regardless of the fact that it was shut down little more than a year later as part of Yahoo's retrenching. With yesterday's launch of Episodic and the recent launch of Unicorn Media, plus last week's $10M Series C round by Ooyala, it's timely to once again try to make sense of all the activity in the platform space. The best explanation I offer traces from my Econ 101 class: supply is expanding to meet demand. Over the past 10 years, there has been an enormous surge of interest in publishing online video by an incredible diversity of content providers. Importantly, interest by content providers has intensified in the last few years. I can vividly recall 2003 and 2004, trying to explain to leading content providers why online video was an important initiative to pursue. Still, their projects were often experimental and non-revenue producing. Contrast this with today, where every media company on earth now recognizes online video as a strategic priority. But even as online video's prioritization has grown, many media companies don't have all the strategic technology building blocks in place. In fact, many continue to use home-brewed technology developed a while back. The range of video features needed continues to grow and evolve rapidly. Consider how requirements have expanded recently: live, as well as on-demand video; long-form programs as well as clips; paid, as well as ad-supported business models; mobile, as well broadband distribution; multiple bit rate, as well as single stream encoding; in-depth analytics as well as top-line metrics; widespread syndication as well as destination-site publishing; off-site, as well as on-site ad management. The list goes on and on. As media company interest has grown, technology executives and investors have taken note. Venture capital firms continue to see online video as a high-growth industry (even if the revenue model for content providers is still developing, as are many of the platforms' own revenue models), with significant macro trends (e.g. changing consumer behavior, proliferation of devices, improved video quality, etc.) as fueling customer interest. Another important factor for platforms is rapidly declining development costs. As Noam Lovinsky, CEO of Episodic told me last week, open source and other development tools has made it cheaper than ever to enter the market with a solid product. With ever lower capital needs, a new video platform entrant that can grab its fair share of the market has the potential to produce an attractive ROI. Of course all the noise in the platform space means media executives need to do their homework more rigorously than ever. I'm a strong believer that the only way to really understand how a video platform works, how well-supported it is and how well-matched it is to the content provider's needs is to vigorously test drive it. Hands-on use reveals how comprehensive a platform really is, or how comfortable its work flow is, or how well its APIs work. While I get a lot of exposure to the various platforms through the demos I experience and the questions I ask, I'll readily concede this is not the same as actually living with a platform day-in and day-out. Another complicating factor is that while there are some companies purely focused on video management and publishing, there are many others who offer some of these features, while positioning themselves in adjacent or larger markets. When I add these companies in, then the list of participants that most often hits my radar would include thePlatform, Brightcove, Ooyala, Twistage, Digitalsmiths, Delve, KickApps, VMIX, Grab Networks, ExtendMedia, Cisco EOS, Irdeto, KIT Digital, Kaltura, blip.tv, Magnify.net, Fliqz, Gotuit, Move Networks, Multicast Media, WorldNow, Kyte, Endavo, Joost, Unicorn Media and Episodic (apologies to anyone I forgot). Again though, this list combines apples and oranges; some of these companies are direct competitors, some are partners with each other, some have a degree of overlap and so on. There's a long list of platforms to choose from, yet I suspect the list will only get longer as online and mobile video continues to grow and mature. At the end of the day, who survives and succeeds will depend on having the best products, pricing the most attractively and actually winning profitable business. With momentum growing for "TV Everywhere" type services, it's to be expected that technology vendors will begin offering products that meet the evolving range of requirements video service providers will encounter. One example is ExtendMedia, which today is introducing OpenCase "Publisher." With TV Everywhere type services still so new, even labeling the various capabilities video service providers will require to succeed is still a work in process. In a meeting last week, Extend's executives helped me understand what will be needed and what the Publisher product provides. To date, much attention around TV Everywhere has focused on "authentication" - how a service provider would implement credentials (e.g. logins and passwords) so only authorized users could access its online video catalog. This gatekeeping step has rightly received a lot of focus, because leakage of any premium video must be prevented. Authentication is tricky though, as users must be verified as being who they say they (e.g. passwords haven't been improperly shared). But assuming for a moment that tight authentication processes are implemented, other challenges and opportunities remain. For example, once authenticated, service providers need to be able to expose only those parts of their overall catalog each specific user is entitled to view (e.g. if I'm not an HBO subscriber, I shouldn't get access to HBO programs online). This notion of "service management and provisioning" means service providers need to create different bundles online, just as they have done offline. And the bundles need to be easy to change: a service provider may want to change a channel lineup and/or a subscriber may want to add a new channel. Service management and provisioning itself requires that there's a scalable content management system in place. The service provider will need to be able to ingest lots of premium video from many different sources while also and accepting and assigning specific rules to each program as needed (e.g. one program may be available immediately and indefinitely, while another will be available just for a week, but starting at a specified future time). In addition, metadata must be assigned so programs can be tracked, and searched by users. The above requirements are further complicated because TV Everywhere services are envisioned to work across multiple devices as well. That means that authentication must also work on smartphones, gaming consoles, portable media players, etc. The devices themselves must be registered and recognized so they can be linked to users' accounts. In some cases license terms will further restrict how specific parts of services are accessible, and under what addition terms (in turn possibly requiring DRM). Last but not least is monetization. Given current plans not to charge extra for TV Everywhere, advertising from online viewing is the main new revenue-generating opportunity. So integrations with ad servers already used by content providers, along with the ability to measure and report on usage, is another crucial capability. Separate, a totally new monetization opportunity will be trying to upsell online subscribers on new services. For instance, HBO might run a promotion offering a sneak peek of a "True Blood" premiere to all TV Everywhere users. The service provider needs to not only support the promotion, but also offer one-click upsell subscription to HBO, and dynamic provisioning of the whole HBO catalog to the new subscriber. As I've written previously, TV Everywhere is an exciting step forward for both the broadband industry and video service providers. Yet it is a very new world where things get complicated very fast. Vendors like Extend - and other leaders like thePlatform and Irdeto to name two - which have traditionally focused on cross-platform support for video service providers are increasingly going to be called on to turn executives' visions into reality.